Jack Brandt sent your Editor this most fascinating mourning cover. The first thing to catch my eye was the lovely split-ring postmark, and the name—GO HOME. Canada is replete with strange sounding and odd town names: take Moose Jaw, Medicine Hat, Flin Flon and Come-by-Chance as a few which come to mind. But a town name in the form of an exhortation—that was a new one for me! Besides its strange name, this is a very fine example of a censored, re-directed mourning cover sent from Canada to China during the First World War, replete with fascinating markings, and a worthy candidate for further study. It bears a single franking of the blue, five cent George V “Admiral” issue, paying the first class letter rate to China. The cover was censored, and closed with a paper censor label reading: EXAMINED BY CENSOR / C. 402). 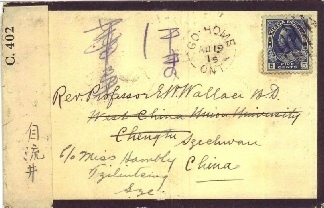 It was mailed from a place called Go Home, Ontario on 19 August 1918 and arrived at the British post office in Shanghai on 30 September, from there forwarded to Chengtu, in the province of Szechwan, and re-directed from Chengtu to Tzilintsing. 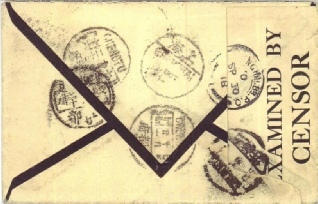 The back of the cover is replete with other Chinese postmarks, conceivably indicating the routing to its final destination. Note: If any MSCC members have mourning covers from places with odd or unusual names, please let your Editor know—this may prove to be a recurring feature in Mourning Notes! The Final Page is a regular feature in the Club’s Journal, Mourning Notes, which is included in membership. To find out more about other fascinating covers, we encourage you to join our club. “GO HOME” - AN EXHORTATION? OR A TOWN NAME!